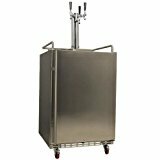 If you love beer, then you’re going to love what the best outdoor kegerator can provide to quench your thirst. Whether it’s a gift for the holidays or equipment for the party you’re about to throw, you’ll find that a kegerator is a gift that’ll keep on giving. Choosing the best model to meet your needs can be somewhat challenging. There are different sizes, different qualities, and different features that must all be considered during the purchasing process. You know that you love great beer. Today, let’s love great beer from a great outdoorkegerator. The technology behind the modern keg fridge is pretty simple. You tap a keg, keep it at the proper temperature, and dispense beer from the tap. How that technology is manufactured and what additional features are included are important key points to consider. The best appliances should be easy to setup, be suitable for the outdoors, but have the versatility to be installed indoors if needed. Be sure to refer to our kegerator installation guide once you’ve found the perfect model to meet your needs. Why Purchase a Kegerator for Beer? When push comes to shove, a kegerator has one basic job: to keep your beer cold. The difference between it and the best beer fridge models is that instead of keeping a few cans or bottles of your favorite brew cold, you have an entire keg at your disposal. The kegerator will also provide you with an easy way to tap your favorite keg of beer so it can b consumed whenever you feel the urge to crack a cold one open. Everyone likes to have a good head on their beer, but excessive foam can ruin the drinking experience. A kegerator is able to maintain the ideal temperature for a wide range of beers, with many offering a full range of 35-65F for storage. 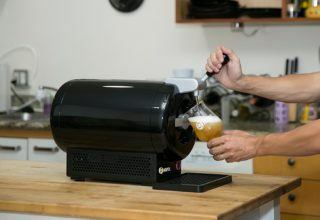 Since foamed beer is beer that is wasted, you gain 3 primary immediate benefits with this household appliance. 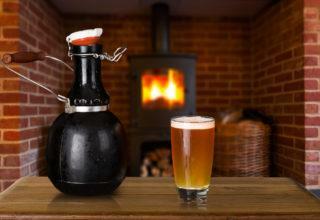 It maximizes the lifespan of your beer, with virtually any beer able to achieve up to 8 weeks of storage. High alcohol content beer can be stored for potentially 1-2 years. It allows you to entertain a large group of people from a single tap without the back and forth into your kitchen or beer fridge. It provides easy access to a favorite cold beer with very little effort to install the appliance. A kegerator might not be the best investment for everyone since it operates with kegs instead of cases. For those who like a different beer frequently, a beer fridge or the best mini kegerator is a better option. If you love one type of beer and that’s what you primarily drink, however, then a kegerator can provide you with a beverage that tastes fresher, bolder, and crisper than from a bottle, can, or growler. Which Model Type is Right for Me? There are several different types of kegerators that are manufactured today. Each type has its own benefits that are worth considering if you’re in the market for one of these useful household appliances. Built-In. Built-Ins are designed to find beneath a countertop. The installation process is similar to that of a dishwasher, though you’ll need a space in your counter for the tower tap. Built-Ins make it easier to reach the beer, but require an extensive and potentially costly installation before it can be enjoyed. Freestaning. This is the easiest way to add a kegerator to your home. Just install it as instructed and then place it where you want it to be. Then add your keg and you’re ready to drink some fantastic beer. Freestanding models are usually on wheels, which means you can move them indoors or outdoors whenever it is needed. Portable. These models are typically smaller and lighter to accommodate more movement. That means they might not hold a large keg, but they can distribute beer almost anywhere. Your best option is to purchase a unit with outdoor qualities, even if your plans are to use it indoors most of the time. 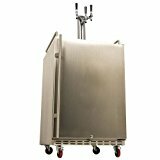 Outdoor kegerators are manufactured with materials that are weather-resistant and often have a stainless-steel exterior, creating a low-maintenance ownership possibility. Any climate works well with a portable outdoor unit since they can be moved inside during the colder months. For those who live in a warm environment, closer to the equator or the tropics, a permanent outside installation is an easy way to have great beer all year long. If you are a homebrew specialist, a kegerator is a good way to distribute your product as well. The only difference is that most homebrewers use Corny kegs, and the average keg fridge doesn’t come equipped to handle that keg type. Thankfully, there are conversion kits available that will let you hook up your homebrew through your favorite model so that everyone can enjoy your creation. How Big Should Your Next Kegerator Be? The size of your kegerator is dependent on the space you have available for it. Look at the dimensions in the reviews and trial reports and then compare those figures to your home measurements. Most models, including compact versions, will provide an interior volume of at least 5 cubic feet. The only exception to this rule would be a mini kegerator, but those are technically a different category. Larger models, especially those that are designed for outdoors, may exceed 8 cubic feet of interior space. For many homes, a single tap kegerator is usually the best option. 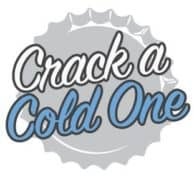 Sometimes, however, you might want to have more than one beer available on tap when the urge to crack a cold one open arrives. In that instance, you’ll want to look at models that have multiple tap options. Dual-tap units are quite common, but if you want the best of the best for your space, a 3-faucet unit is a possibility. You’ll want to make sure you know what kegs fit into the multiple tap models before purchase. Some dual-tap models will only accept 1/6 barrel kegs. The best kegerators will accept two or three ½ barrel kegs. That way you have a massive amount of beer and an excuse to consume it. 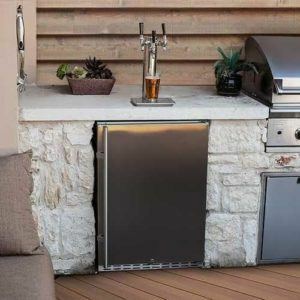 If you’re looking for the a top-rated outdoor kegerator, then you’ll want to invest into features like commercial-grade galvanized stainless steel, wear-resistant vinyl exterior coatings, and foamed-in-place installation. This will give you the best consistency for storing your beer while providing you with the freshness you crave when it’s time to enjoy a beer. There are some additional features worth looking at for a buyer in today’s market. ABS Scuff Plating. Many models offer stainless steel keg racks. What you won’t always find is a threshold scuff plate that protects your household appliance. If you plan to use your new kegerator on a very regular basis, look for it to have a thick ABS plastic scuff plate to protect your investment. Temperature Variation. Most designs will provide you with a maximum cold temperature rating of under 40F. Some will provide a maximum hot temperature rating of 60F or greater. The vast majority of models fit into a range between 35F-50F, so it is up to you to determine what temperature variations you’ll need for your beer. Deep Chill. Look for a unit that offers a deep chill function to minimize the foam without compromising the head of the beer, the quality of the body, and the flavor profile. Automatic Defrost. You’ll want this feature when it comes time to clean your kegerator. It’s similar to the function you see on chest freezers. Additional features that may be included on some models are removable drip trays, top guardrails, casters, and shelving for internal storage. 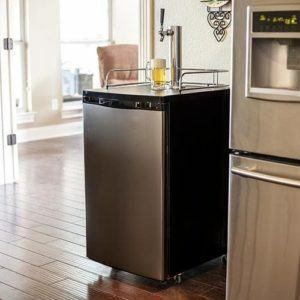 Although it may seem like common sense, do make sure that your new kegerator comes with the connecting hardware, air lines, and beer lines that are needed so you can get a frosty mug of your favorite cold brew. Some units are sold with these connections separately, so pay careful attention to the product description. If you’re looking for a basic, portable outdoor kegerator, then you’ll find most models will satisfy your needs in the $300-$600 range. At this price point, you’ll still receive a few features, like a drip tray or top guard rail, on a single tap design. Built-in models tend to cost a little more, especially if they will be outside full-time. On the premium end of the spectrum, a triple tap, single tower, outdoor model with built-in cabinetry or beer fridge with commercial-quality components can be over $3,500. Most will be able to find a quality unit for around $450. If a basic unit is all that’s desired, some entry-level models can be priced as low as $200. This is your all-in-one solution. It includes a complete keg tapping kit, comes with a 5lb aluminum CO2 tank, clamps, couplers, and your CO2 regulator. You will need to fill the tank locally, but when you see the large interior of the kegerator, you won’t mind one bit. It can hold up to two 5-gallon D-system kegs or three 5-gallon Corny ball-lock homebrew kegs so you’ve got plenty of beer options at your disposal. It will also hold any full-size keg. If you’re ready to step things up to the big time, this is a cost-effective way to make it happen. We like this smaller kegerator because it keeps the temperature of the beer nice and low. 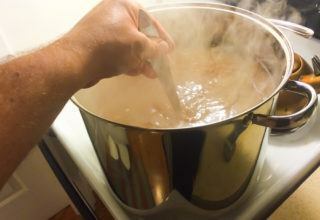 It worked best at temperatures in the mid-30s and provided a consistent draft experience. With the help of the 5lb CO2 cylinder, this freestanding model includes casters that work as intended and a drip tray that limits your spills. Stainless steel options are available, but we preferred the lower price of the standard model. It holds ¼ and ½ kegs, but will not use rubberized kegs. Definitely a solid investment option. 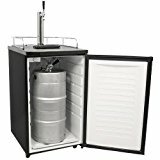 If you like to do your own brewing, then this is the portable outdoor kegerator that you’re going to prefer. It comes with a two-faucet system without kegs so you can use your own product. The included keg tapping kit lets you create a direct connection with your product and the interior is large enough to hold two 5-gallon kegs. The black cabinet is easy to clean and looks nice in almost any room, while the chrome guard keeps your pint glasses from falling over. This model is also an energy-efficient design, so you’ll see a power consumption savings over many other models. Easily one of the best units we got to see in this category. 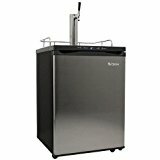 This single-tap full-size kegerator gives you the ability to keep virtually any beer fresh for at least 3 months. It can accommodate a pony keg or hold two 5-gallon kegs if you prefer. There’s an adjustable temperature control that lets you maximize the body and flavor profile of your beer, while the three-sided rail gives you a nice working surface to use for pouring. It’s approved for commercial use, which means it has plenty of power to pour a great beer at home time and time again. This black and stainless steel model is a beautiful addition to any space. It is a freestanding model that is easy to use, offering a digital display that makes the adjustable temperature feature a nice option. Additional features include a drip tray, guard rail, and casters for portability. We found it to be compatible with half-barrel, Corny, sixth-barrel, and slim quarter kegs. Two wire shelves are included to transform it into a fridge for those times when you don’t have a keg lying around to use. It’s a great price for a fantastic appliance. This compact kegerator is a nice option for those who want to entertain, but don’t have a lot of space. It has a wide temperature range, from 32F to 53.6F, so several different beer varieties can be properly maintained with this equipment. The drip tray is a nice addition to the work space, which is minimized because of the overall design of this model. Two wire shelves are included in the box, but the external CO2 tank will need to be purchased separately. We found it to be a nice little system and think you will too. If you’re looking for the ultimate setup, then this is the kegerator that you’re going to want. It offers 6 shelves, dual towers, and a superior level of space. The temperature range is a little limited, only going to 41F, but its total capacity is nearly 20 cubic feet. You’re going to be able to fit 3 kegs into this setup. If you want to hold bottles in it, the total capacity is over 600. It will also hold over 1,100 12-ounce cans. If you entertain regularly or you’re installing a full home bar, then this investment is one that will add plenty of value to your space. 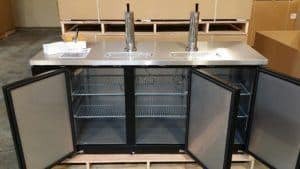 There are many kegerators that can work indoors and outdoors, depending on what your exact needs happen to be at the time. Very few models are equipped to be outdoors on a full-time basis. This is one such model. The front ventilation, forced-air refrigeration, and commercial quality components make it an excellent addition to any home or business. There is a dual-gauge regulator, triple couples, and a triple tap beer tower that will distribute your favorite beverages. If you’re looking for the best, this is it. With 5.1 cubic feet of capacity, this model features a spring-loaded tap that gives you one of the easiest dispensing designs in the category. The CO2 tank is half the size of other models, but you’ll also find this particular unit is also half the price (or better) than other models as well. The tower is 13 inches of chrome, providing a beautiful look, while the Sankey D double tap system lets you take advantage of your favorite beers in a draft style. The setup takes some time to get right, but once you do, it’s a solid system that works great. This model is designed for outside use and is compatible with in-cabinet installations. It features a safety lock, interior LED lighting, and stainless-steel components throughout. Several possible keg configurations are available with this model, including a full keg. The temperature range is 32-60F and is maintained by reinforced flooring and draft components. We also loved the option of being able to reverse the door and set the preferred temperature with the touch of a button. It’s the perfect addition to any outdoor relaxation space.